You can be wrong. Oh wait. Did somebody just say something? You can be wrong, but when an author’s wrong and makes you wrong and you finally discover the error, even if it’s years later, it makes for interesting blogging, I can tell you that. Concatentation, anyone? The “Minaret Chakari”. Or as I’m calling it here, the “Chakari Minaret”. Same thing. I don’t know anything about those little figures standing to the right, but they give you a sense of scale. You have to admit that as a “column” it’s somewhat phallic. At least in this image from this angle taken around 1991 or something, not long before it came down. And it’s actually not a “column”. Vladislav Tamarov. It’s all his fault. ← Here’s what it looked like in 1983 in Vladislav’s book. “The column was built by the troops of Alexander the Great many centuries ago.” And I believed it. I’d never heard of this thing before about 2005 looking into Mr. Tamarov’s book. But I was hooked. I brought it in myself for re-sale. The book, that is. Ten Speed Press. It was a reprint. I didn’t realize that at the time. I was just fascinated by the book. And so, years later, in 2015, in connection with another project, I was gratified to see the book, one copy, which I very much wanted to have a look at again, was on the shelves at the Vancouver Public Library, Main Branch. I just want to make that clear. Things are confusing enough. Those little figures at the bottom of the “tower” or “minaret” are Russian soldiers. Somehow, Vladislav Tamarov, who took the picture, got his facts wrong. The book, originally titled “Afghanistan: Soviet Vietnam” was published in San Francisco in 1992. It’s full of very interesting black and white pictures of Vladislav Tamarov’s Russian Military unit in Afghanistan, a unit overwhelmingly made up of young men 18 – 20 years old, many of whom didn’t make it home. The text is an excellent translation. The book greatly impressed me in 2005 and it’s done it again this week in 2015. Vladislav Tamarov couldn’t get his book published in his own country. I can understand how he felt about that. He emigrated to the United States. He flogged copies in San Francisco and on the streets of Manhattan, New York. I was saddened to learn that Vladislav Tamarov died in Nevada on December 26, 2014. He was 49. He was an artist. “This massacre,” is how he referred to what was going on in the Afghanistan depicted in “Afghanistan: A Russian Soldier’s story”, the retitled reprint I read. The VPL’s copy I’ve been massaging the last few days is the original “Mercury House” edition. I spent quite a bit of time trying to come up with data on the “column” by “troops of Alexander the Great” not far from Kabul. There was none and I wondered why. 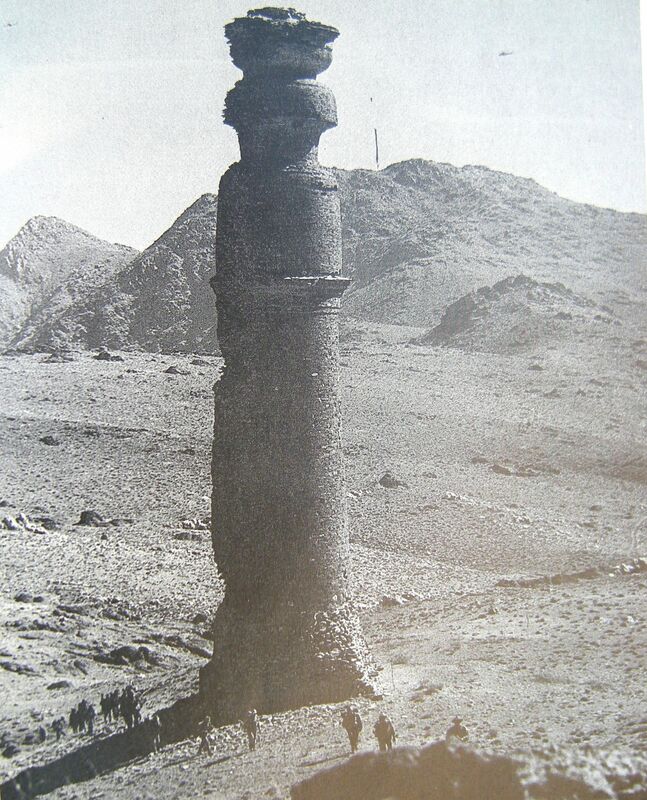 Finally I discovered that the “minaret” or “tower” or “column” or “pillar” was put up in the 1st century AD and is of Buddhist provenance. What does provenance mean? It means these were the people who built the thing. And so “minaret” isn’t exactly the right word either. At least not originally. 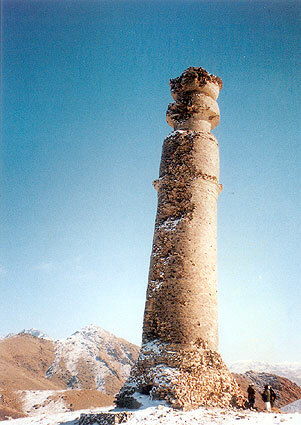 The Taliban attacked the “Minaret of Chakari” as part of their modernization plan for Afghanistan. It became a pile of rubble in 1998 having lasted a mere 2000 or so years. I’m way over my word count and I hope I don’t get fired. I’ll be right back. This entry was posted in Absurdities, Certainties, Inevitabilities and tagged Afghanistan, Alexander the Great, Buddhist, Chakari Minaret, Kabul, Russian soldiers, Ten Speed Press, Vladislav Tamarov. Bookmark the permalink. I forgot to credit the colour image. Wish I knew who took it.